When attempting to interpret an 18th century house, it can be challenging to get a sense of how the world looked and felt back then. What did 18th century Annapolis and its residents look like, and how can we as interpreters of history show that to visitors to Hammond-Harwood House? One of the things we offer for classes that come to the House on field trips is the opportunity to try on clothing of the era. Boys wear breeches, shirts, and cocked hats, while girls get to try on petticoats and gowns. We don’t, however, have anything as elegant as the ensemble above from 1774 to offer them. This is a watercolor by Ann Frankland Lewis that is now in the collection of the Los Angeles County Museum of Art (LACMA). There does not seem to be any information about Lewis except that between the years 1774 and 1807 she selected a gown from a fashion journal, made a watercolor rendering of it, and titled it “Dress of the Year.” All of Lewis’s watercolors, including Ms. 1774, can be seen here. The Hammond-Harwood House staff decided that we (and our wonderful docents of course) needed a day out of the office, so on Monday we took a field trip into Washington, DC. Curator Emeritus Ellen Miles was nice enough to give us a tour of the “Capital Portraits: Treasures from Washington Private Collections” exhibition at the National Portrait Gallery, which she and Carolyn Kinder Carr co-curated. The exhibit was unbelievable, with a breathtaking selection of rarely-seen portraits from the 18th through the 21st centuries pulled solely from private collections in the DC area. The exhibit will be open until September 5 and you can find more information, and a sample of the portraits on view, here. This show should not be missed if you are at all interested in portraiture, or in marveling at what size home someone must have in order to accommodate a twelve-foot-tall painting. 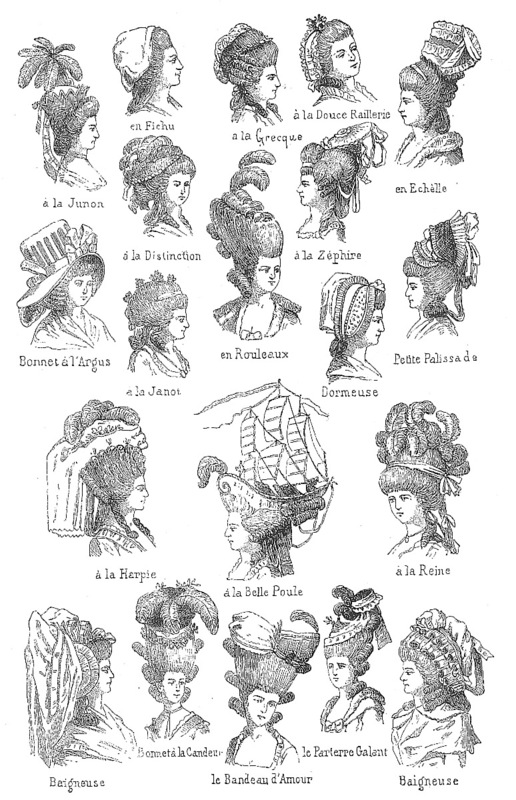 My favorite style shown is “a la Belle Poule,” with the frigate in full sail perched atop a woman’s head. The Belle Poule was a French naval ship that defeated the English ship HMS Arethusa on June 17, 1778. 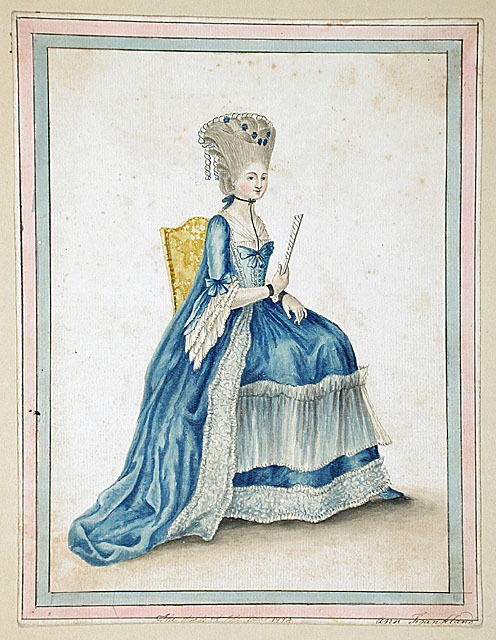 Supposedly, this hairstyle was worn by a lady at the French royal court to celebrate the victory. All sorts of fun stories exist about the lengths Frenchwomen went to for their high hairstyles, including having their hairstylists stand on footstools and ending up with mice nesting in their giant coiffures. There’s probably no truth to the stories, but it makes the effort women put into their hair today seem positively low-maintenance in comparison. When you go on tours at multiple historic houses, you start to notice a number of “facts” about American history that are repeated at all of them. The problem is that many of these so-called “facts” aren’t true; tax rates were not based on how many closets you had, ice cream wasn’t brought to America by Thomas Jefferson, and the paper sugar came wrapped in wasn’t used to dye fabric. It can be hard to accept that these stories, which we’ve heard over and over again and may be guilty of perpetuating ourselves, are just that: stories. But we owe it to the visitors who take tours of our historic sites to give them as accurate a view of American history as possible. One of my favorite blogs exists to help museum interpreters do just that. “History Myths Debunked” is written by Mary Miley Theobald, a writer and former history teacher and Colonial Williamsburg employee. She takes great joy in ferreting out the truth behind these historical myths, and her quest for the truth is always well-researched and usually entertaining as well. Today’s photo was inspired by the fact that I was allowed to remove the plastic sheets protecting my desk from the falling grit caused by the roof restoration project. I have worked here for over two months and today was the first time I saw my desk without plastic covering it. I thought about posting a picture of my desk, but decided that this one was much more attractive (and actually historically significant). 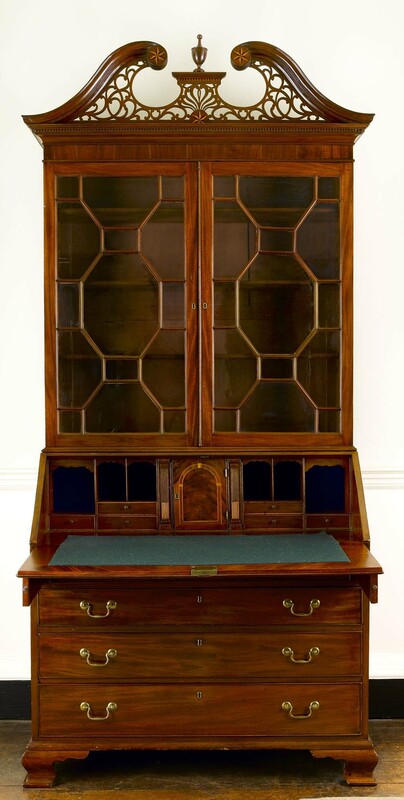 The desk-and-bookcase pictured above is the centerpiece of the room known as the study at Hammond-Harwood House. 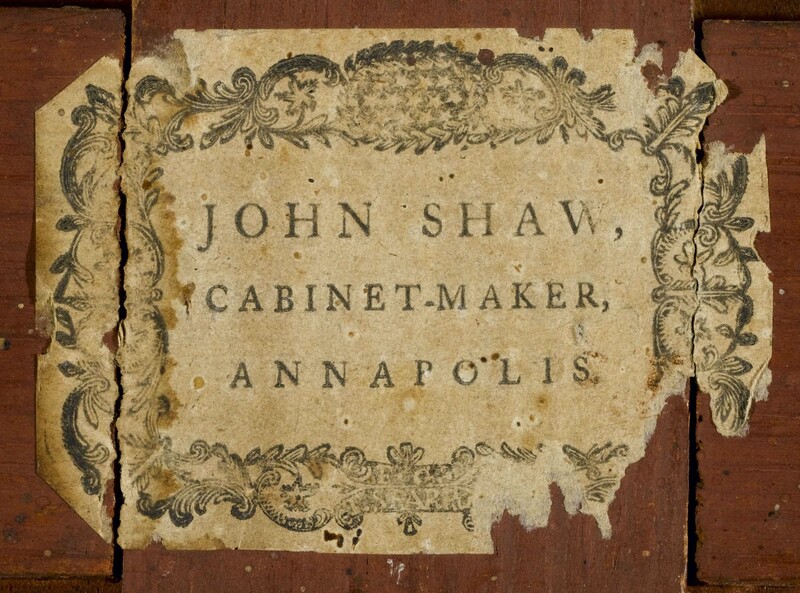 It was made circa 1797 in the workshop of John Shaw, the best-known of the cabinetmakers working in Annapolis in the Federal period. While Shaw’s workshop turned out a variety of furniture forms, according to the catalog from the 1983 exhibit “John Shaw: Cabinetmaker of Annapolis” at the Baltimore Museum of Art, “the desk-and-bookcase is one of Shaw’s most impressive and, probably, expensive productions.” The desk combines the Chinese influence of the earlier Chippendale style (visible in the fretwork on the doors) with the inlay popular in the Federal era. It is a substantial, decorative piece of furniture, and a functional one as well. An 18th-century gentlemen of knowledge and wealth needed a place to store his books, write his letters, and organize his business papers. It was an exciting afternoon here at the Hammond-Harwood House, as the crew from State Circle on Maryland Public Television paid us a visit. I had a lovely time showing correspondent Lou Davis around the House; he was particularly interested in our collection of Peale portraits. State Circle airs on MPT on Fridays at 7:30pm and the segment featuring Hammond-Harwood House should air in a few weeks! 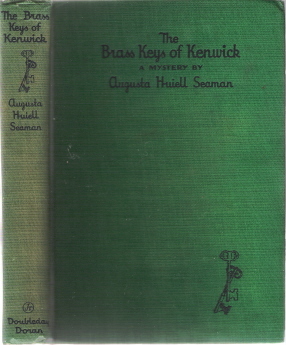 This is “The Brass Keys of Kenwick” by Augusta Huiell Seaman, a young adult mystery published in 1931. The story is based on the life of the last private owner of the Hammond-Harwood House, the reclusive and impoverished Hester Ann Harwood. We have a copy in the office and I read the first half of it this week. If you grew up reading Nancy Drew or the Bobbsey Twins, put Seaman’s books on your must-read list. She wrote over 40 books and a number of short stories, mostly mysteries with a historical bent for middle schoolers. I wanted to post a photo of Augusta Seaman today, but have so far been unable to find one in the depths of the Internet.